This name uses Spanish naming customs: the first or paternal family name is Nadal and the second or maternal family name is Homar. Antonio "Toni" Nadal Homar (Spanish pronunciation: [anˈtonjo ˈtoni naˈðal oˈmaɾ]; born 27 February 1961 in Manacor, Mallorca) is a Spanish tennis coach. 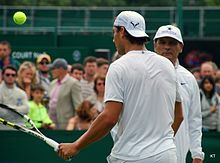 Toni Nadal is the uncle and ex-coach of tennis player Rafael Nadal and the elder brother of Spanish footballer Miguel Ángel Nadal. As of 2018, he is the most successful coach in the history of tennis in terms of Grand Slam titles, winning 16 Grand Slam trophies with Rafael Nadal. Toni Nadal was the third child, having two other brothers. His younger brother Miguel Angel became a professional football player for FC Barcelona. 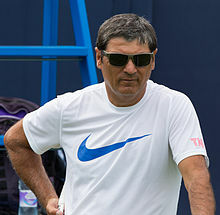 Toni Nadal tried participating in several sports including football, table tennis, and swimming. He achieved the title of junior champion of Balearic Islands in his table tennis career. He was the first of his siblings to play tennis when he started doing so at fourteen years old. Nadal was inspired to join the sport when he saw Ilie Năstase win the Barcelona Masters in 1972. Nadal worked as a tennis coach and as a manager for a tennis club. He obtained a trainer’s degree and taught at the tennis club his brother Miguel was a member of in Manacor. Nadal also became a manager of the Manacor tennis club while teaching younger students. At this time, Nadal began coaching his nephew, Rafael Nadal. The majority of Toni Nadal’s coaching career has been spent with Rafael. Nadal has described his coaching style as 'hard', saying that he occasionally puts too much pressure on Rafael, but that he does so because he wants him to succeed. When Rafael was younger, he would be nervous of having lessons by himself with Nadal. Rafael stated that as a child he would sometimes return home from tennis lessons crying. Nadal believed that being such a hard coach would make his pupils better tennis players. Nadal required that his pupils show respect for their equipment, and stated that he would immediately stop coaching Rafael if he ever threw his racket out of frustration. Nadal believed that throwing a tennis racket showed a lack of respect towards people who could not afford the same equipment and the sport itself. Nadal strives to teach players to be responsible for themselves. He trained Rafael on poor tennis courts with old tennis balls to show that it was not the equipment that would decide if he won or lost. He believed that losing was a fact of competing in sports and that the only one responsible for winning or losing was the player. Nadal had an authoritarian attitude with the players that he coached. He wanted his opinions to be important to players he was coaching rather than it just being advice. He did not want to be paid by Rafael Nadal because he believed that it would make him less of an important figure. Without being paid, he could say whatever he felt without a chance of Rafael being able to fire him like a regular coach. Since June 9, 2013, when Rafael Nadal won his 12th Grand Slam title defeating David Ferrer in the Roland Garros final in Paris, Toni Nadal assumed sole possession of the top position on the history of tennis with 12 Grand Slam title as a coach. He broke a tie with Lennart Bergelin who coached Björn Borg reaching 11 Grand Slam titles between 1974–1981. Solidifying his lead on the coaches' rank list, Toni Nadal has currently 16 Grand Slam titles with his nephew. In 2015, after Rafael Nadal lost in the second round at Wimbledon to Dustin Brown, who was ranked No. 102 at the time, former world No. 1 John McEnroe said on BBC Radio 5 Live that the Spanish tennis star should "get a new damn coach". Rafael had failed to reach the semifinals at all four Grand Slam events that year. In February 2016, at the Buenos Aires Open, Toni Nadal admitted that Rafael would have probably already replaced him had he not been his uncle. In December 2016, Rafael Nadal added countryman Carlos Moyá, a former number one tennis player in the world, to work alongside Toni Nadal as his coach. Toni Nadal was the first one to contact Moyá to see if he would be willing to join Rafael coaching team, believing it would be the perfect time to include him. Carlos is also expected to be working with Toni with projects for the Rafa Nadal Academy. In Late February 2017 Toni Nadal announced that he decided to retire from his nephew’s coaching staff. Toni had informed Carlos Moya and his brother (and Rafael’s father) Sebastián, of his intentions. Toni originally withheld the knowledge of his plans to separate from Rafael, who found out when it was released in the news. Toni did not inform Rafael of this decision because he did not want to distract Rafael from his tennis. Toni stated that he came to regret keeping this information from his nephew. Currently, Toni plans on working at the Rafa Nadal Academy. He stated that he wants to work with younger players and develop their talent. Rafael stated that he is happy to know that Toni is doing what he wants and does not hold any resentment towards his departure. Rafael also stated that he believed it was a good time for Toni to focus on projects like the Academy. ^ a b c d e f g "Toni Nadal Interview- French Tennis Magazine" (PDF). French Tennis Magazine. 413. October 2010. ^ a b c d e f g h i Kay, Dimitri. "Tennis Profile: The Man Behind The Player, Toni Nadal". Bleacher Report. Retrieved 2017-04-17. ^ a b c d "Rafael Nadal: Uncle Toni terrified me but without him I'd be nothing". Telegraph.co.uk. Retrieved 2017-04-17. ^ a b "Wimbledon 2015: McEnroe tells Nadal to 'get a new damn coach'". BBC. 3 July 2015. Retrieved 31 March 2016. ^ "Toni Nadal: "Si no fuera su tío, Rafa ya me habría sustituido"". El Mundo (in Spanish). 13 February 2016. Retrieved 31 March 2016. ^ a b c d e http://www.washingtontimes.com, The Washington Times. "Rafael Nadal adds Carlos Moya to coaching team". The Washington Times. Retrieved 2017-04-17. ^ a b c d e f g "Toni Nadal snubbed Rafa after deciding to quit". NewsComAu. Retrieved 2017-04-17. ^ a b "Rafa's classy response to coach's shock exit". NewsComAu. Retrieved 2017-04-17. This page was last edited on 27 January 2019, at 11:00 (UTC).